This time the Legends are taking on Rock and Roll in Memphis in the 1950’s and more specifically Elvis Presley’s contribution to music as a whole. It’s easy to see the schtick behind Elvis and his guitar because no story about rock and roll is complete without the whole sell your soul to the Devil element, and I have to admit that given Elvis’ gospel roots, this is on a more interesting level than most that use the same plot device. In fact, the religious aspect of the story is a major factor, though the character of Uncle Lucious goes from one extreme to another which weakens the progression of the antagonism in the story. Regardless, the episode fits the history of Elvis into the narrative in interesting ways. It’s not perfect and it has very cringe-worthy moments but Elvis is far from the worst portrayal of a real-life historical figure in Legends of Tomorrow. In fact, the story does honor the contributions of Elvis, without getting too pandering, thanks to Nate’s idealistic view of music striking a relatable chord with the audience. 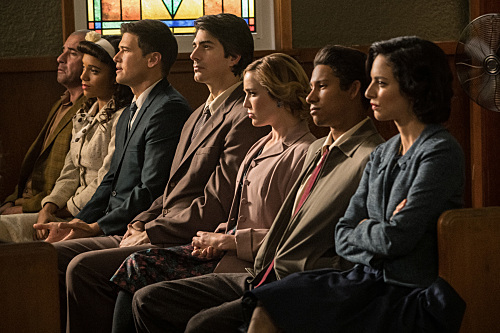 If I were nitpicking I’d say that Zari’s attempts to keep Wally from breaking the show’s tension were transparent and the racial turmoil in Memphis during the 50’s was a major aspect of the history that “Amazing Grace” was touching on and should have been a bigger part of the story. Regardless the episode is often funny, sometimes sweet, and just a little bit weird so even if it didn’t break new ground or really get in to the Mallus storyline, it’s still doing everything that Legends has been doing to make this season a good one so I can’t complain too much. Ralph accuses Iris of not being able to understand the pressure he’s under and the fear he gets from Devoe due to her not having to physically stick her neck out on their missions. This accusation hits Iris hard and she decides to help in a minor mission to question a witness and ends up having Barry’s powers transferred to her after a chance encounter with a meta that can transfer powers from person to person. Now she gets her wish of being an active member of the team when she becomes The Flash. This isn’t just about Iris getting a taste of Barry’s powers, which it easily could have been and still been pretty good. Instead, it’s about Iris sharing all the difficulty Barry has with using them. What’s even more impressive than that nuance though is the way that Iris’ part in the team is inherited by Barry, and we can really see the pressures that Iris faces in her role are able to handle because of her ability to think on her feet and react, whereas Barry can’t help but crack faced with the same hardships. The scenes involving Iris using the speed were incredibly tense as well because it’s clear that she doesn’t understand the mechanics and that sometimes leads to her making things worse. With this perspective we can clearly tell that Barry’s powers aren’t omnipotent, they have clear drawbacks and there’s a fine line he treads between making things better and helping people and making things worse and endangering them. It’s a lesson in a necessity for both Barry and Iris’ place on the team, and a true wake-up call for the actual danger the field-ready members of the team experience. 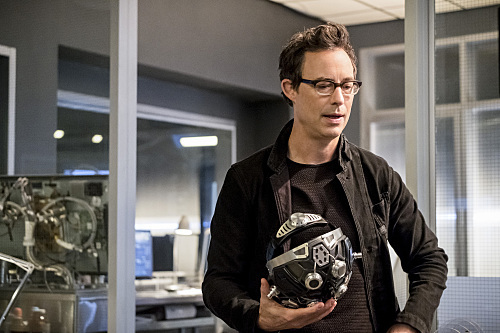 It’s a Flash episode that’s very practical in its construction, and so more than anything the turmoil feels fully realized and harder to discount as plot-devices. 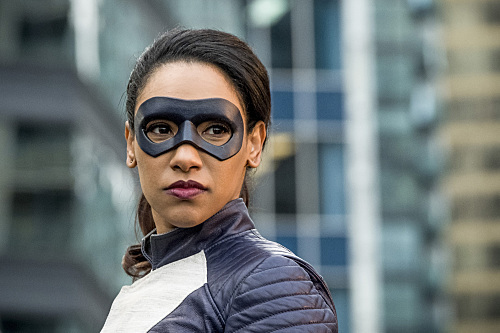 Iris’ position in Team Flash was starting to get a little stale and her character was slowly being resigned to the dregs of “great women behind men.” How this episode ultimately ends up is it puts Iris back on a path that makes sense for her character and we can’t really see how that’s going to affect the workings of the Team just yet but it allows for an important aspect of Iris’ character to make a comeback as her primary motivation and passion (ie: her love for journalism.) Unsurprisingly this is an episode about Iris but it’s not immediately apparent. This one took a little while to get started, and a side story that takes up a lot of the time comes from Wells trying to create his own “thinking-cap” to outwit Devoe. It seems to mostly be about Harry’s insecurity at having to go head to head with someone who is actually smarter than him, which is a good plotline. However, it’s a bit transparent. I feel like the characters should be able to tell that his “plan” comes from a place of inadequacy because even I was able to punch holes in his logic and I’m just some jerk with a TV and an internet connection. Besides that, it just doesn’t really work. The plotline is handled with sincerity and even a sense of duty but it never really fits. At no point does no one see through Wells and that undermines all the characters that I supposed to be smart and empathetic. Speaking of empathetic, Ralph’s character takes the cowardice a little too far and that also undermines his growth in the season thus far. It makes sense that ‘s scared and it’s an understandable motivation but his willingness to let other people get hurt invalidates lessons he learned in like two other episodes prior which is making it seem like his development is conditional and fickle. Honestly, I have a lot to say about these two gripes but they are relatively minor. “Run Iris, Run” Is the valuable perspective of a rookie speedster that we didn’t even get from Wally or Jesse discovering their powers. The questions that Iris asks only expand on the Flash’s mythos and rules, and it allows for a better understanding of how Barry’s speed really works mechanically. Believe it or not, the greatest asset of “Run Iris, Run” is actually the fact that it works to help ground the Flash. Well…that and the return of Iris’ passion. It’s cool to see her part of Team Flash now, but that never really needed to come at the expense of a dedicated arc, did it? This is why I was excited about Black Lightning. The mix of Black culture and Superheroes is rife with possibilities that other similar stories don’t touch on. A perfect example of this in action is a scene where Annissa purposely attacks (in a training simulator) an innocent civilian because he’s wearing a Confederate flag on his t-shirt. When Jefferson condemns her for it, he lays out an example of a moral fiber that can’t be superseded as superheroes, despite personal differences. It’s simple but given all the ways the story has developed Annissa thus far it was a tremendous opportunity for character growth. This episode is mainly (and thankfully) all about Anissa and Jefferson working together on their first real mission. It’s “Take your daughter on patrol” day or in this case “Take your daughter on a clandestine mission to clear the name of your superhero persona in a bogus murder charge” day. This episode lives or dies on the interactions between Anissa and Jefferson while they work together to solve Lady Eve’s murder and that’s luckily where the episode is strongest. The way Jefferson critiques Anissa’s use of her powers gives the audience a better understanding of how they work and makes us invested every time it becomes time for her to use her powers because we can play the home-game in our minds and better empathize with her in a given situation. It’s the Green Arrow training Speedy plotline that we never got to have and Black Lightning nails it. There are three other parts of the episode that really struck me, two is good ways and one in a bad way and I really don’t want to finish this review without touching on them. I’ll start with the bad one. Gregg Henry is a good actor, but this character he’s playing might as well be The Man from “Undercover Brother.” I would have preferred a bit more character development before a shadowy white guy pulled up and completely bypassed reasonable self-awareness to exposit an evil plan targeting a predominately black city. Now on to the good stuff. Clearly, someone realized that the character of Gambi wasn’t connecting, because “The Book of Revelations” makes Gambi’s past a key part of the plot later on. It’s handled with gravity and the exposition does the job of informing us why it matters. Instead of wrapping this up with Gambi the episode leaves it hanging to allow for further exploration which is a good idea because “The Book of Revelations” does not answer all the questions left to be asked. The other good thing about this episode is a big one. Lala is back. Lala was a better villain than Lady Eve in the short time he was on the show, so it’s a clear improvement for “Black Lightning” to put more effort into him going forward. But they’re still trying to go with a creepy thing for the villain, so Lala has like voodoo powers or something now but the juxtaposition between his love of rap, his street smarts, and cred, and his connection to the grave is far more effective than any of the theatrical Poe crap that Lady Eve pulled. Besides all that, the episode ends with Jennifer revealing her lightning powers to Anissa, so “Black Lightning” officially has me invested. I’m seriously jumping up and down for next week’s episode. Final Word: A good-natured and low-key tribute to the life and work of Elvis Presley gave Legends a worthwhile installment this week, a unique approach to being a speedster from a different perspective makes The Flash a valuable addition to the universe, but “Black Lightning” is about superhero training and being a father. It’s about trying to guide and teach a person you care about and being personally invested in their success. It’s Batman training Robin, Green Arrow training Speedy, and The Flash training Kid Flash. It’s as absolute to superheroes as capes and it is a fantastic live-action interpretation of that particular cliche. All around it the story of Black Lightning continues to evolve and only seems to be improving. 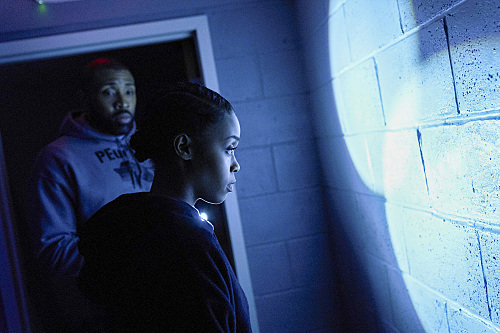 For that reason, ” The Book of Revelations” ended up being not only the best DC/CW show of the week, it was possibly the most solid, throughout the entirety, episode of “Black Lightning” so far.